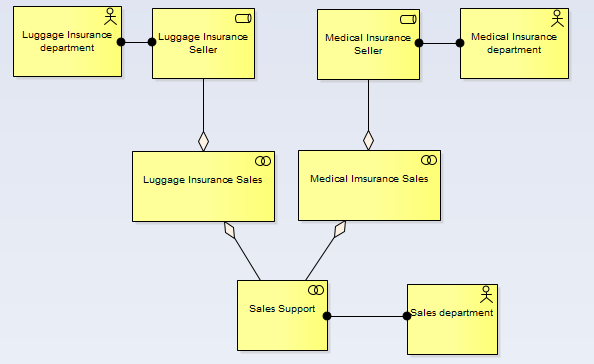 The UML language gives us some simple graphical elements to represent the key ideas. I find that diagrams like this really don’t need explaining, even to non-UML readers. a couple of the Use Case include another one. Using this notation style doesn’t seem quite as obvious. The tool which I used for the diagrams – EA – helpfully added some default colors to the diagram, which I have removed, just to make the point that I don’t think this diagram is anything like so immediate. A box which says <<Actor>> doesn’t seem so obvious as one which has a stick-person. 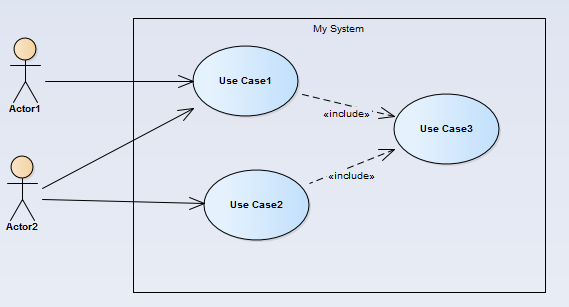 Which is why I have never seen a UML Use Case diagram use the rectangle notation. So why use Rectangles ? I think that this diagram is easier to read than the one above. Apart from the disappointing visual pun of the ‘role (roll)’, the other two bits of notation seem sensible: the Business Actor looks like a person ,and “collaboration” as of two overlapping circles seems sensible. …which is a shame, because I really think that the more visual cues we give our readers, the easier they will find it to understand what we’re trying to say. Like Gerber, I believe PowerPoint and Visio, and especially ANY kind of clip-art are death to modeling, but these aren’t those kinds of random images: they are part of an industry-standard notation, which will be the same no matter who draws it. Perhaps this is why I found Gerben’s book such a hard read. He does use a consistent color scheme for the Archimate layers, but uses the rectangle style for the boxes, which seems to make the diagrams very similar to each other. Even though they are saying very different things. And all the boxes are deliberately the same size, which means he can’t use the obvious abstraction of ‘big box = big thing’. So i’m going to stick with my ‘child-like’ modelling, and use the non-rectangle notation. I never wanted to be a grown-up anyway.